Welcome to your source for Jeep body lift kits and accessories. If you’re looking to lift your Jeep CJ, Wrangler, Cherokee, Grand, or any other type of Jeep, we’ve got you covered. We offer an array of body lift kits that will help you fit tires without any headaches. Why choose a body lift? This is an easy one! A body lift is nothing more than a spacer between the frame of your Jeep and the body (the painted surface). This spacer will move the body up, thereby increasing the size of your wheel wells. If you’ve got larger wheel wells then you’ll be able to run larger tires, giving your advantages both on and off road. A body lift is considerably cheaper than a traditional suspension lift – running between 1/5 and 1/20th of the price! 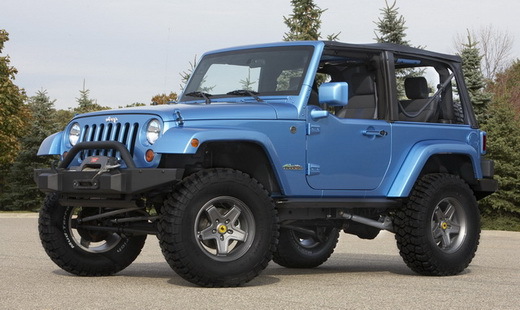 If price is a concern for you, then ExtremeTerrain is your source for Jeep Wrangler Lift Kits. Why not a normal suspension lift? Don’t get us wrong – a traditional suspension lift it not a bad thing, but they do have disadvantages. A suspension lift will raise the frame of the vehicle, resulting in the most common complaint – poor on road handling. This is because the suspension geometry changes. A suspension lift will force you to have your suspension realigned, and you may need additional components depending on your setup. With our body lift, you just install the body spacers and go!